Whether you’re looking for a garden water pump for a waterfall, a fountain, a koi pond, or any other water feature, you’ll need an appropriately-sized pump with solid reliability at a reasonable price point. In this article, we’ll look at the best pond pumps, and go over everything you need to know to get the water flowing. 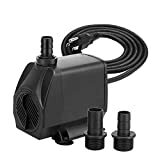 4.1 How Strong of a Pump Do I Need For My Pond? 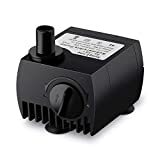 4.3 What Kind of Pond Pumps Are Available? 4.4 What About Fountains? Can All Pumps Be Used For Fountains? 4.5 Do All Pumps Work with Both Salt and Fresh Water? 4.7 How Much Does it Cost to Run a Waterfall Pump? After a thorough look at several of the top water pumps available, we’ve found that the Hydrofarm Water Pump is the best waterfall pump available for most cases. It is set at a medium price point, and is quite powerful. You can trust it not to harm either your fish and aqua-plants. It is a dual pump that works submerged and, with an extra fitting, out of the water too (inline). Because of its power, it is perfect for outdoor ponds and indoor water features. The same model comes in six different sizes, so you can get the exact fit for your pond. Should you desire a high flowing fountain, this model is perfect. With a lift height of up to 12-ft, it should cover most requirements. And finally, the Hydrofarm pump has many portholes for attaching extra fixtures. it is well worth paying a little bit extra for its versatility and reliability. For more information on the Hydrofarm pump, see the Product Reviews section below. Running very close with our winning pump is the Kedsum Water Pump. This one has a lift height of up to 13-ft for those who want a more powerful fountain feature. Another bonus is that this pump runs in fresh or saltwater ponds and aquariums. The Kedsum is a versatile pump that is easy and quick to clean. The motor runs quietly making it ideal for indoors, though it is also an outdoor pump too. Should you experience any problems, Kedsum has supportive customer services. 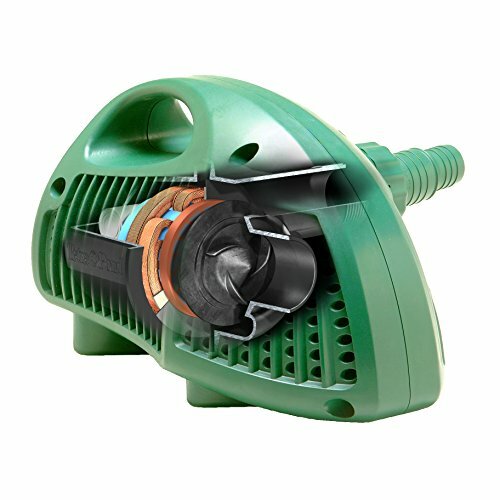 For further details on the Kedsum Garden Water Pump, see the Product Reviews section below. 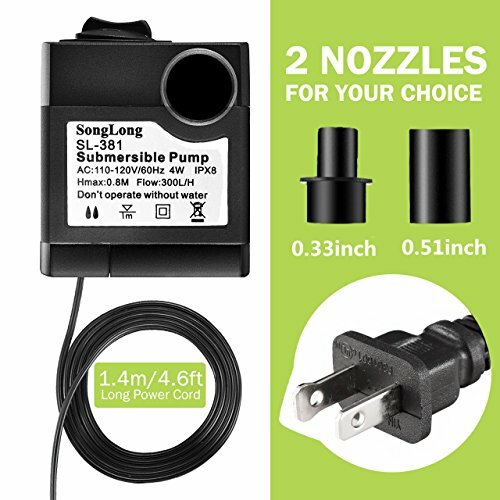 The Homsay Water Pump is a mini pump with a powerful reputation and a super low price. Because of extremely low price, many users consider it a disposable pump rather than a permanent one. They have indicated that it occasionally only lasts up to a year, though sometimes longer. It is ideal for the smaller indoor fountain as it runs very quietly. If you have a water fountain for pets, then the Homsay should keep the water circulated nicely. 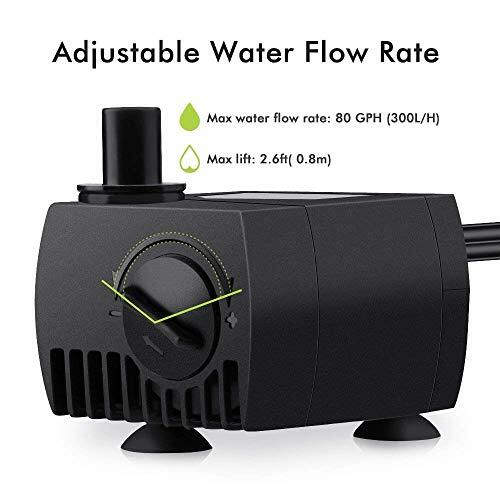 To learn more about the Homsay water pump, see the Product Reviews section below. There is nothing more relaxing than listening to, or watching, a water feature. Perhaps it is a small pond water feature or a garden waterfall. Or perhaps you’ve got a koi pond, and want to add some additional water movement to complement the beauty of the fish. It could be indoors, perhaps a tabletop fountain or an aquarium. Or use your pond pump in an outdoor pond with or without fish and aquatic plants. All helping you to relax after a hard day’s work. Water features do need some maintenance from time to time to keep them running efficiently. One of the best ways of ensuring clear crisp water is to use filters and pumps. A pump will ensure your water keeps moving, which helps to oxygenate and eliminates algae. We have reviewed five different pumps. The points we have raised will give you an idea of what key features you need to look for when buying a water pump. Hop on over here if you’re looking for a more robust pond pump and filter system for koi ponds and the like. And conversely, if you are looking for an ultra-simple fountain system, be sure to check out a solar fountain! In this section, we’ll look at a few of the extra items buyers may want to keep in mind while looking for the right water pump. 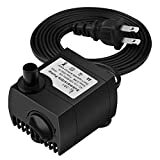 How Strong of a Pump Do I Need For My Pond? From there, multiply your total volume by 8 gallons to determine how many gallons your pond is. There are approximately 8 gallons of water in 1 cubic foot of water. Example: A 10′ long x 5′ wide x 4′ deep pond would have a volume of 200 cubic feet. Multiply that 200 by 8, and you have a pond that has 1,600 gallons of water. Once you have the size of your pond, you want to find a pump that will circulate the water at least every two hours. In the case of the pond above, you would want an 800 Gallon Per Hour (GPH) pump to cope with that sized pond. This will produce water that is reasonably clear. If you want crystal clear water that doesn’t require much additonal maintenance, you want to shoot for a pump that will circulate your water twice per hour. In the example above, you would want a 3,200 GPH pump. Measure the width of the waterfall at the point where the water drops (the weir). Round to the nearest foot. Measure the height of the waterfall from the lower pool to the top of the head of the waterfall. This will give the overall height that the pump needs to push the water. Multiply the width of the weir by 1,500 for an average flow; 1,000 for light flow; and 2,000 for heavy flow. Find a pump that will flow with adequate power (GPH) at your required head height. Keep in mind that if you have 90′ bends on your tubing, add an extra foot or so to the head for each 90′ angle. Also, add an additional 1′ of head height for every 10′ of tubing you use. What Kind of Pond Pumps Are Available? Pond pumps are available in two major formats, submersible pumps, and external pumps. 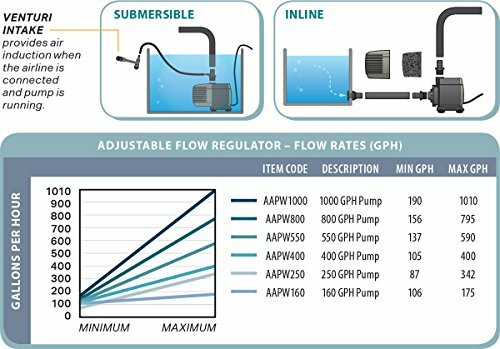 Submersible pumps use the water flowing through the pump to cool the pump down, generally lowering the cost of the pump. Of course, that means that you’ll have to take the pump out of the pond for maintenance. External pumps are cooled in other ways, and are easier to access and maintain, but are often more expensive. What About Fountains? Can All Pumps Be Used For Fountains? Not all pumps can be used for fountains. Only pumps that have the nozzle on the top can be used for fountains. You may need a fountain kit for your pump, regardless, that will create the spray pattern. See here for pump/filter combos that often include fountain nozzles. Do All Pumps Work with Both Salt and Fresh Water? Some pumps work with salt water, some with fresh. A few pumps will work with both. Be sure you choose the right format for your requirements. The larger the water pump you choose, the larger the diameter of the tubing you’ll need to connect and use your pump. Generally, all the listings provide details in what size tubing you’ll need for each individual pump, but the basics of sizing are shown here. The flow of water through a tube increases exponentially as the diameter of the tube increases. How Much Does it Cost to Run a Waterfall Pump? Much depends on the size of the pump and the amount of time it’s running. If the pump is only meant for aesthetic purposes, and not for water filtration purposes, you will only need to run it while you’re in the area. In these cases, you’re unlikely to notice change in your electricity usage. If you are going to use your pump for filtration or water quality purposes, you’ll likely run it more frequently, which will add a few dollars a month to your bill (depending on the size of the pump and the amount of time it’s used). It’s best to keep your pumps on timers to ensure you’re not running them more than you need to. Of course, if you have fish or other animals that require constant water filtration, you’ll want to keep the pump on essentially all the time. This will add a bit more to the electric bill, but still will likely be in the +/- $10 per month range. This is dependent on the size and type of pump, though. Python Products Inc. - Misc. Also included in kit: hose connectors, faucet adapter (brass), pump for faucet. The Python clean system is ideal equipment for a partial clean-out of bigger aquarium tanks. It will not disturb the fish or décor in the tank. This system drains and refills. If gravel tube supplied is not long enough for your needs, it can replaced with the correct size. The brass faucet adapter should work on most faucets. If not, try removing the aerator from the faucet, or the washers in the brass adapter. Hydrofarm Active Aqua Submersible Pump Filter Bag, 10.5" x 13.125"
Increase the life of your pump by placing it inside this fine mesh zippered bag. By keeping your pump protected from debris, it will not need as much maintenance. Even the zipper is corrosion proof! Most users find this product a valuable part of their water system, as it protects the pump from large debris. Just keep in mind that it may not be ideal in all types of ponds, as it has a very dense mesh. If your outdoor pond has lots of algae, it may clog the mesh. This would mean that the bag itself needs cleaning on a regular basis, defeating the object a little. Though if you pond does have lots of algae, you should probably be using more pumps and filters to clear it. Every pond needs tubing for fitting to filters, pumps, and splitters. This brand is a Best Seller. Should you want to seal one of the ends, then fold the end over and place a good clamp on the folded strip. If you have problems keeping it submersed, weigh it down with a piece of string tied to a heavy rock. Some users find that the tubing on this one can be a little stiff, but it is ideal for outdoor use. Works great in fountains and waterfalls. Pumps are an essential part of running a water feature successfully, particularly if you have fish or plants. One of the key features of any pond or aquarium is good oxygenation. While ever your pump is moving the water, you can be confident that you have fresh oxygenated water. In this section, we’ll look at five different lines of pumps, each with different sizes, featuers, scales, and use cases. We’ll conclude with our favorites. The Kedsum line of garden water pumps is a great choice for many water features. 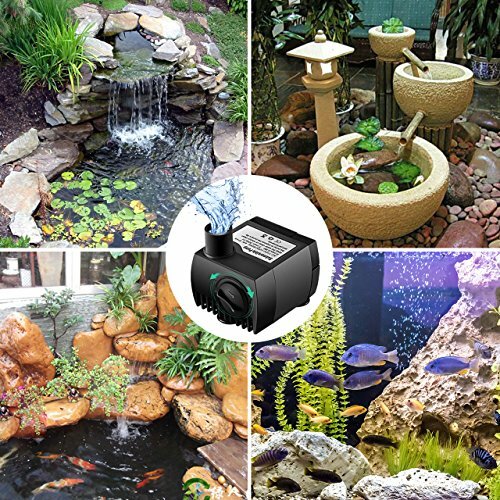 With five different size options, It’s great for larger aquariums to smaller ponds and fountains to hydroponic garden systems. There are no seals, making it is a complete unit. The size is ideal to be non-obtrusive and if used indoors, it even has suction cups to fix it in place. Here’s a quick breakdown of the five different sizes available. It will continue to operate between temperatures of 0-95F (0-35C). You must submerge it fully into the water before switching on, or you may risk burn-out if running out of the water. While the inlet percolator protects the inner mechanism by keeping out debris, you will still need to clean off mud from the outer surface. The good news is that this little model is easy to clean. Some users find that the pump clogs less frequently without the provided black foam, and tend to remove it. This would be a personal choice depending on your own setup. The Kedsum has lubricant on the impeller shaft to ensure the motor runs smooth and quiet. Add more if necessary, once the pump is removed from the water. Clean away any excess lubricant before putting it back in the water. 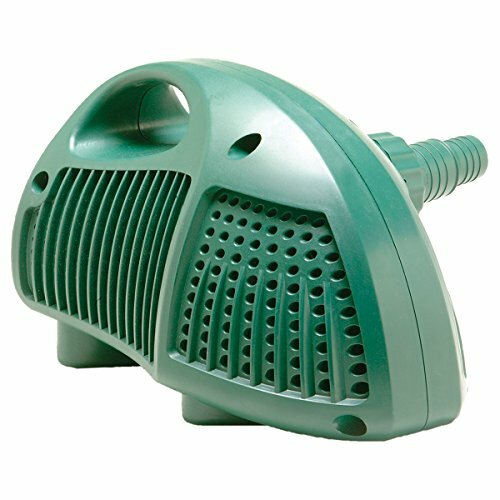 Most users find that this pump works well in fish ponds, and helps keep fish and plants healthy when used correctly. If you have sensitive fish in a small area, it may not be the ideal pump to use. The outlet adapters come in a variety of outside diameters (OD) of .51, .63 and .75 of an inch. Each one allows for a different strength of water flow. The pump does not come with a hose and is measured with a metric thread for vinyl tubing. The correct size tubing should be between ½ to ¾ inch, depending on which OD adapter you use. Some users are a bit bothered by the noise the Kedsum pump puts out — some find it a little louder than it should be. If your aquarium is an entertainments room, consider running the pump on a timer. That way you can it will not run when you don’t want to hear the quiet humming. Additionally, adding a little lubricant to the impeller, as we recommended earlier, might do the trick to quieten the pump down again. 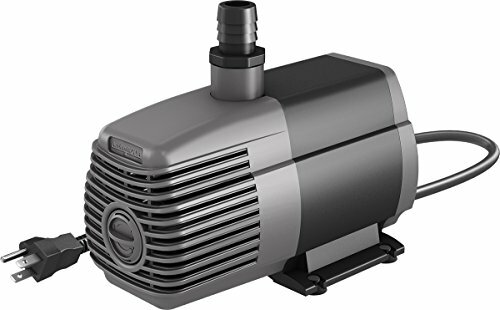 This is a powerful little pump and good value for its low cost. Not all users find that it can reach the promised lift height of 13ft, so if you need to hit that precise height, well, you might be disappointed. Should you not be happy with your purchase then worry not. Kedsum customer services have a good reputation for helping their customers. The 1000gph is suitable for a pond volume of 100-gallons and more. It has rubber mounted feet to hold it in place on certain surfaces. You can also use this pump to drain away water from your pond, by using the bottom drawer fitting (Supplied). The Hydrofarm pump can work submerged in the water, or inline which is out of the water. To use it inline, open it up and take out the mesh filter. In its place, attach the supplied grey barbed fitting. To use this function, the pump will need to be lower than the water level. When using it in water, there is a port for attaching an air induction tube that allows aeration of the water. See the here for the instructions manual, showing you exactly how these functions work. The Hydrofarm 1000gph is ideal for ponds like koi ponds, large aquariums, and hydroponic systems, indoors or outside. The Hydrofarm line of pumps is generally very quiet when in use. Just make sure the pump never runs dry when submerged. Also, note that this is not a pump for saltwater. It has a few ports for fitting the various extras mentioned, such as using it as a bottom drawer pump. 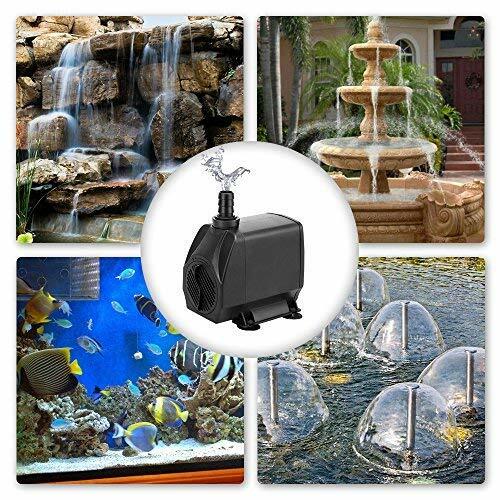 Hydrofarm’s pumps are powerful yet lightweight pond, aquarium, and hydroponic pumps. They move water well, though they don’t cope with debris very well, so you may need to clean inside about once a week. For warranty details and troubleshooting, have a look at the instructions manual. Run it all the time, or fit a timer for the hours that suit your pond’s needs. The Homsay water pump is a quiet running, mini-sized pump. It’s one of the smallest on our list and is also quite inexpensive. The large dial situated at the front allows you to adjust the flow rate of the pumping water. It’s extremely easy to use and is quite basic in terms of its options and configuration.Water pumps in through the open slots and passes out again through one of the two provided nozzles. This pump can be attached to a fountain and works quite well for that purpose, but the pump must remain submerged or it will burn out. Be sure to watch your water levels! When it comes time to clean, this is an easy machine to open and clean-up the insides. Just don’t forget to unplug before taking it out of the water as there is no on/off switch on the pump itself. And conversely, always submerge the pump fully before firing it up. It has three suction pads to stabilize it on a glass surface. 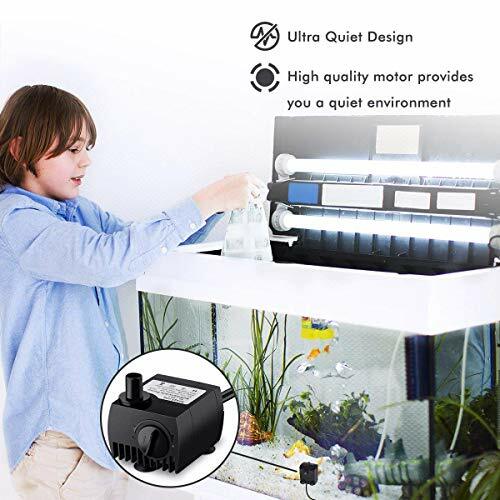 It’s ideal for an indoor tank, a small pool or small pond waterfall, or a small hydroponic system. There are no filters inside this model so keep an eye on debris collection around the pump itself. Nor are there any tubes included in the pack. It should not be used in salt water, as it’s for freshwater use only. This little pump is a very economical buy. Should you have any real issues with it while still in its guarantee, Homsay customer support is very helpful. Many users are happy with the pump in tabletop fountains and pet fountains. Some have used it in a hydroponic system with much success. It is a bit too small for a large pond but would work well in a small indoor aquarium because it runs so quietly. Just keep in mind that some users find that this pump only lasts a year or so, and is essentially disposable. The good news is that it’s so inexpensive that if it fails out of warranty, it’s not a big cost to replace. They’re pretty well built, with the motor is encased in a solid basket that will stop large debris from entering. This protective encasing also protects plants and fish from getting inside the pump, ensuring that the pump will work properly for a long time. The impeller can cope with ¼inch sized debris pieces which pass through without affecting the efficiency of the motor. This is a pump built to last and does not need constant cleaning. It will circulate the water for lengthy periods with little maintenance. The motor and impeller are unidirectional, making it very energy efficient. While it is not a filter, it will filter out large debris to prevent damage to the inner workings. The Tetra Pond Pumps will run 24/7 without a problem should you need it to, or turn it on and off with a timer. One user indicated that this model had been running 24/7 for 15 years for them, which is mighty impressive. During cold months, the pump is safe to run unless you are expecting icy weather. If it’s gonna be freezing, switch off the pump. It is always better to leave a pump running in the winter if you can. Position it higher up the pond, but still submerged in the water. This means it won’t disturb the fish that prefer the bottom of the pond where it is warmer in cold weather. The pump has an automatic switch-off which triggers should it overheat. You will not be able to regulate the flow of water unless you are knowledgeable about fitting extra valves. Though you could try running a thinner ID line to the waterfall if you don’t want the full powerful flow. The Tetra Pond pumps only have one port so this will limit what you can connect to it. 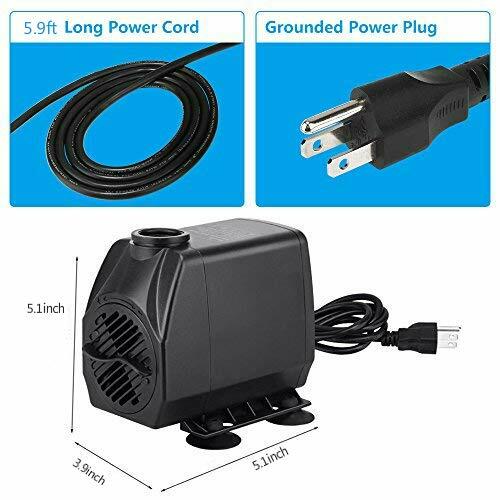 It is a submersible pump so will not work out of the water and must be used in freshwater only, not salt water. This model comes in different sizes but both are better for the larger pond. Overall, the TetraPond line of pumps is quite solid and is a good choice for those looking for large, substantial pumps. And the three-year warranty is always a nice perk. That said, they’re pretty pricey, so keep an eye on the cost with these! ENERGY EFFICIENT: Unidirectional impeller and motor. Includes 2 nozzles: 1/4inch and 3/8inch adapters. The VicTsing 80gph pond and aquarium pump is a mini pump, a small-scale unit that can fit in the palm of your hand. While it is very light and small, it does have four suction pads to hold it in place, which is great on the right surfaces. The pump also runs quietly and has a plus and minus knob to turn the flow rate up and down. For a monthly clear-out, it is easy to disassemble but you must unplug and take it out of the water to do this. Don’t forget that if you’re using the pump for pet fountains, fish, or plants, don’t use harsh chemicals in the cleaning process. One little tip, if it does start to make a noise, is to add a little cooking oil to the rotator blades when you next clean it. If you decide to do this, be aware that the pin holding the propeller is fragile, so go about it gently. As with most submersible water pumps, it will need to be fully placed into the water before you switch on. If not, you risk the engine burning with a dry run. Be aware that the electrical cord does not detach should you need to run it through specific holes in your fountain or tank. The VicTsing 80-gallon pump is good for the smaller fountain, fish tank, or hydroponic system. It is very similar, if not identical, to the Homsay pump of the same size. Should you experience any problems with the VicTsing model, you can be confident that customer services are supportive of their own products. The five line of pond water pumps we have chosen each have their own special features. (with the exception of the mini Homsay, which is much the same as the VicTsing). The Hydrofarm pumps, our top choice, is a positioned at a good price and has excellent user feedback. The Hydrofarm is one of few pumps that can be used in, or out, of water. Many water pumps can burn out if not submerged fully in water, but not this one. Kedsum’s line of pumps, our runner-up choice, also has unique features, such as being able to use in both fresh and salt water. Most water pumps are made for one or the other, but not both. The Kedsum is easy to keep clean because it does not get clogged up. It comes with an inlet percolator that helps to pass dirty debris straight on through the machine. Finally, the Homsay mini-pump is our budget pick, an inexpensive yet efficient pump. Just keep in mind this one has a limited lifespan. This is essentially a disposable unit, but it is still an ideal pump for the smaller water features. The Tetra pump was the most expensive water pump we reviewed, and these are ideal for larger pools and fountains. It has excellent customer feedback indicating it is robust, reliable and built to last. It does come with a long warranty, so that’s a useful addition when you’ve paid such a lot of money.